PPO # 18012 | Ventura, Oxnard, Camarillo, Westlake Village, Thousand Oaks Simi Valley and surrounding areas. While I was in the military, I was an Explosive Ordnance Disposal (EOD) Technician and Officer. For those of you who don’t know what EOD is or does; it’s essentially the military’s “bomb squad”, tasked with disarming and rendering safe military ordnance and improvised explosive devices (IEDs). This job taught me the importance of training. As an officer in EOD, it was my responsibility to ensure that my personnel were properly trained. If I didn’t provide training to increase the proficiency of my personnel, I was putting their lives in danger. Private security companies generally have a bad reputation, which is unfortunate due to the importance of a security guard’s job. A security guard is in charge of the protection and safety of people and their assets, including, in many cases, millions of dollars’ worth of equipment or property. With this much responsibility, it is a shame that some private security companies skimp on security guard training and qualifications. The lack of training provided to security guards not only puts the guard’s life in danger, but it puts the site and its personnel at risk as well. Instead of mitigating risk, an untrained security guard can increase the liability of a property or business. 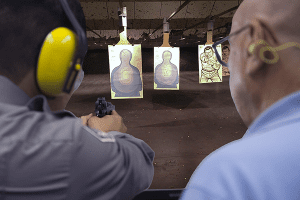 At Cobalt Security Services, staff training is an obligation. By providing only trained guards to each and every client we serve, we truly manage risk and increase the safety and security of a site or property. Each of our security guards must attend over 80 hours of training, most of which is conducted by our in-house trainer, a military veteran and veteran law enforcement officer with over 22 years’ security experience. Each course was selected by our board of directors, in conjunction with our trainer, ensuring that every one of our security guards is familiarized with current safety and security protocol, ethics, and professionalism. We even provide a list of security guard training subjects on our website. Many people ask me why Cobalt Security Services trains their guards on ethics. I think that ethics is one of the most important aspects of any job. It all boils down to trust. A security guard is tasked with the huge responsibility of caring for lives and/or high dollar value items. If our clients can’t trust us, then how can we properly provide them with the service they deserve? Many times, a security guard will have access to places or rooms that most people are not allowed or have after-hours access when sites are otherwise empty. We instill in our guards a moral compass to help them make the right and ethical decision when no one is around. Our clients place a lot of trust in Cobalt Security Services and our security guards. We do everything we can to earn and keep that trust. That is actually a very good question. Many times, private security companies will have a list of classes that they “teach” their employees. Unfortunately, that list of tasks that they “teach” is only there if the client asks. In most cases the guards will have never heard of their company’s security guard training program. It can be difficult to tell whether security companies truly put time and money into training their guards. Do your homework! The best thing you can do is ask for an outline of their curriculum. But, be cautious. A checklist of items that can be taught in 15 minutes is not a curriculum. Any legitimate company worth contracting will have a written curriculum explaining what each class goes over and how many hours of classroom time that class requires. Reading the curriculum should give you a solid idea of what the guards are being taught during these courses. Also beware if the security company you are speaking to takes a week to provide you with the curriculum. If they truly have courses designed for training, they should be able to get it to you immediately. Another good thing to do is follow up with the guards on your property and ask them about the training they have received from their company. Whatever the case may be, don’t underestimate the importance of training for your guards. Training that a private security company gives, or doesn’t give, to its employees can tell you a lot about the integrity of the company you are looking to hire. Security companies that offer training take your security seriously by investing time and money in the guards they hire. Before you commit to a private security firm, make sure that they properly train their guards. PPO # 18012 | Serving Simi Valley, Thousand Oaks, Newbury Park, Westlake Village, Agoura Hills and nearby areas. Copyright © 2019 Cobalt Security Services. All Rights Reserved.